Our content instructional goal this week was centered around the spread of Islam and cultural diffusion in the post-classical era. Our skill instructional goal was centered on document analysis. The students displayed their understanding of the documents through short answer and the document based question. How do I know the students learned and know what they were supposed to learn? Last week the overlap of skills and content was perfect! To replicate last week, I attempted to do the same thing this week. 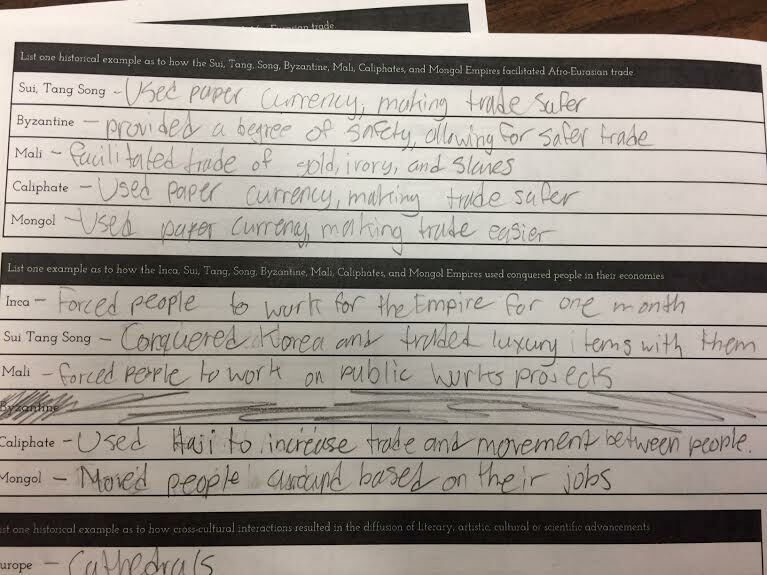 There was a shift in the skills (from long essay to dbq). Despite that shift, the content was on the rise of Islam and all of the documents (skill) were on the rise of Islam. Each day the students analyzed new documents about the rise of Islam. So while they were building up their skills reading and analysis skills to interpret the documents, they were learning the content they needed! One of the days Linda Ashida graciously came into class and documented each phase of the day's lesson with video. 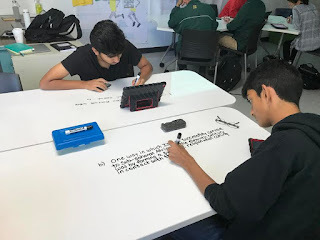 This has been great an opportunity to reflect on what happened in class and to better see and assess what the students know, and where there might be gaps. I have outlined a few of the videos to cite more specific evidence of the learning that took place. Here I am going over what the students need to know for the week. Students analyze a document on the spread of Islam in Ghana. Students write their short answer response. Great examples from the short answer using transition words such as prior and before to signify a change. Examples of pulling evidence from documents and placing the evidence on the map. I am in love with the direct overlap of skills and content. The skills are not in isolation and the content is not isolation. They are learning the content so they can apply the skills. Then they are using the newly acquired skills to show they know the content! Again, the rubric that I used throughout the week was essential in getting the students to self-check their progress. 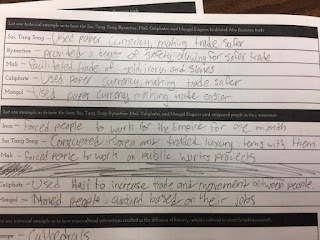 In truth, the progress on the dbq was good, but there is a lot of room for growth. By the end of the week, they were going to write a thesis, context, and a paragraph from two sources. However, the students did not end up writing the paragraph by themselves. Using student evidence and feedback from earlier in the week, I realized––and the students realized––that they were not quite ready. As a result, to give them more time and additional support to better prepare for the writing on their own, I had them work with partners. To check for understanding on the content standards, the students had a content check. Most of the students mastered the material. I gave a small assessment covering the content objectives. From that check, an area of need highlighted from the assessment was cultural diffusion in the post-classical era. The rest of the content was great with only a few minor tweaks needed. I lost a bit of focus for a few days. I had two students come in and share some of their misconceptions. That with some information released by the AP World chief reader made me question a few of the things I have been doing in class. On a more positive note, I love the attitude of my students and I am so glad they came in to share understandings of the material. I attribute this to the clarity of the learning targets and the meaningful work done daily in class. The students are constantly trying to learn and are not fearful of making a mistake. They want to know how to be successful and are willing to attempt it because they know they will get feedback on their progress. But, I need to stay the course. Onward and upward! But seriously, this class is hard. I am continually trying to relay centuries of global history and have them read and write about complex documents. The progress towards the little goals is what I need to be content with, which at this point is stellar.